It's not every night that one can go see a legendary band, but on June 22, one can see a legendary band. With their Brave New World-referencing name, impressive longevity, and impeccable, unpredictable post punk sounds, The Feelies should probably be on your concert bucket list. 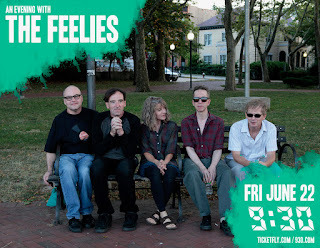 If you're in DC, circle June 22's 9:30 Club show as a night not to be missed. To win the pair of tickets I have up for grabs, simply send me an email letting me know you're interested in checking out this legendary outfit. Embellishment and stories are always encouraged. If you're spooked about the idea of missing out, go ahead and buy your tickets ahead of time and be confident in knowing that you're in for a heck of a night. FINE PRINT: Contest is for two (2) tickets to this here show. Contest closes at noon Eastern on Wednesday, 6/20/18. Good luck!